“The soldiers also came up and mocked him. Again and again the mockery flowed over the Lord. The crowds, the religious leaders and now the soldiers. They had probably seen other kings fall away beneath the onslaught of the Roman legions. Now as the occupying power they had little interest in this so-called king rejected by his people and their religious leaders. Matthew tells us that “sitting down, they kept watch over Him there.” (Matthew 27:36) There was nothing else for them to do except watch these three suffer and die and ensure that no one attempted to interfere or try to release them. They would have watched the crowd as well. Perhaps they wondered at the triumphal scorn of the religious leaders, at the group of women huddled together and supporting each other – and particularly the older person in their midst. They would have noticed the cluster of men watching in haggard silence, devastated by some inner agony that may have puzzled them. But after all these were just another three criminals unfortunate enough to have been captured and then dismissed from life. But these things happen. And as long as they don’t happen to us it doesn’t really matter ………. 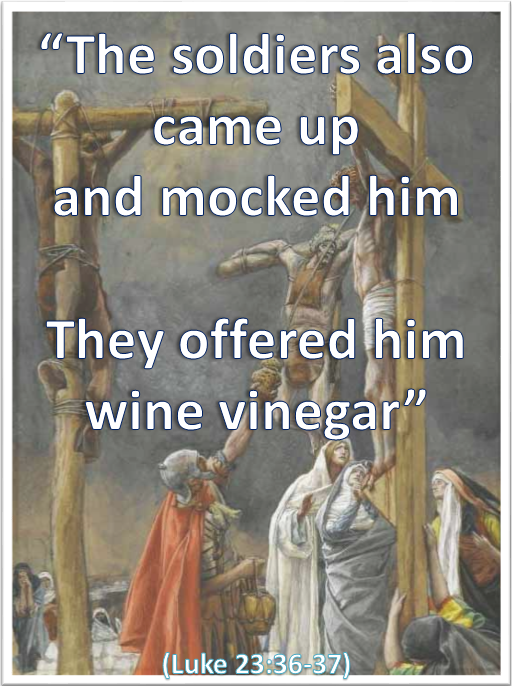 However, one of them did give Jesus some of their cheap wine to ease His thirst. And that, much to his surprise, has never been forgotten. It never will be. Such a strange group of people who reached out to bless Jesus. The woman who bathed His feet with her tears, the woman who poured her precious perfume onto His head and a soldier who gave Him a drink on the cross. Each one doing ‘a beautiful thing’ to Him – and always to be remembered. Categories: Christianity, Daily Life, God | Tags: Cross, Daily Bread, Jesus, Lent, Love, Luke, Perseverance, Scripture | Permalink.